Mmm...You know, despite all of my recent food aversions, my taste for Korean food remains intact. In fact, I crave most of it. And that pancake rocks, by the way! We past Irivne Tofu House on our last trip, but we didn't have a chance to go in there. But if this new place is as good as you say, maybe we should meet up there next time we are in town. If love korean soup you'll definetly love this place. I think they make the best BEEFiest soup and some dang good Kim Chi Jigae among other stuff. I've been meaning to private message you about my visit to Hashigo about two weeks ago. All I'll say now is, with this weather we've been having lately, you are so right that tofu stew really hits the spot!! yeah, it's def sundubu season. i also crave hot pot/shabu. is that pancake thingy a korean seafood pancake--kinda doughy with chunks of seafood? Elmo, is the korean restaurant on culver/walnut still there? It's next to the Caspian persian restaurant. I remember there was also a korean restaurant named "Korean Restaurant" on the outside haha. I used to frequent both of those restaurants. I didn't know the Tofu House wasn't there anymore. See what happens when you stop looking?! Yum...I could REALLY use that soup right now! Hey Elmo - Great post as always...I still remember the maps of tofu houses you did last year! Most definitely! Then I can try that pancake, whatever it's called. I really have to get out to Garden Grove. It's perhaps the only city that has more Korean joints than Irvine. I was *this* close to trying Hashigo last week. But I was a half hour too early and they weren't open yet. I settled for a less than memorable lunch at California Wok a few doors down...I was depressed for the entire afternoon. I did, however, walk away with a take-out menu from Hashigo. I've got my eye on the K-style Mackerel and the Twice Cooked Crispy Chicken. I think if I had to choose the best, I'd say it's Kaya on Culver, next to Assal Pastry, simply because their banchan is all-around perfect. But the tofu soup there seems indistinguishable from the one I had at Goong. I haven't tried Cho Dang on Irvine Blvd. but I have been to the Cho Dang in Cerritos -- and it was damn good. I snuck a peek at the pancake thing while it was being served at a table across the room. I believe it had meat in it (could've been seafood). It almost looked like an okonomiyaki, but with no mayo or seaweed flakes on top. Do you know what it is? There are three tofu soup places there in fact, as I wrote in a previous blog post. The one next to Caspian has changed hands and is now called Kaya. And it's better than it was before in my opinion. The "Korean" restaurant is also still there. And I'm sure it'll stick around...there's still a line on weekend nights. I was surprised too! I hadn't realized how long it's been since I was at Irvine Tofu House...I guess it was...last winter! You've got a great memory! I think that was actually the last time before this latest post that I had sundubu! The pancakes are called bindaedok (bean-deh-duck - if you want a phonetic spelling). They're usually made with seafood but there are some that are filled with kimchee only. Dip them in a little bit of soy sauce that has rice wine vinegar, sesame seeds, a little sesame oil and hot red chili flakes added to it . . . yum! That's how my mom would make them. I thought Cho Dang (in Irvine) was mediocre. If you haven't tried it already, you might want to give Wheat Mill Restaurant - it's the hut in the parking lot shared with Sushi Wasabi - a try. Great kimchi chigae, nakji bokkum (spicy octopus with rice),and kimchi fried rice. Lots of comfort-type foods that you can't always find in other Korean restaurants. Hey Elmo, I'd just heard about Goong restaurant opening but you beat me to the punch! Maybe I'll go check it out for SqueezeOC next month anyway. Our new restaurants this month: Gyu-Kaku in Huntington Beach, Quinn's in Tustin, Veggie Grill in Irvine, Monkey House Cafe in Huntington Beach and Hashigo in Costa Mesa. Loved the post. To be honest, I never realized that there was a non-spicy version of sundubu jjigae! I went to Irvine Tofu House a while back and I think I ordered a sundubu jjigae with beef. I was surprised when it had clams in it. I happened to like it, but I know some people really don't like seafood. Is it that this dish is always served with some seafood in it? Those pizza pancakes are super good, and they are called haemul pajeon. I would consider them more like "crepes with savory toppings," including seafood and herbs. Also, like Alvin, I am surprised that you didn't get spicy sundubu jjigae! You are of Southeast Asian descent! "Non-spicy" is not in your culinary vocabulary, so I thought! Gotta love that Korean soft tofu. When the weather turns cold, that's where it's at. I prefer Kaju Soft Tofu on Walnut and Jeffrey. Aw, I liked Irvine Tofu House. Was just there two months ago. I wonder what happened? Thanks for the info on the pancakes! Sounds awesome! I have tried Wheat Mill actually. It was quite good (had the thin noodles in the clear soup). I was too self conscious to take pictures and do a proper review because I was the only one in the restaurant (at 10:30 in the morning), and the owners were doting on me like I was their own son. I'm going to have to go back and try other items you mentioned. I scooped Squeeze OC! But yeah, this one, I think, went under people's radars. I found out only because Irvine Tofu House is a regular haunt of mine. Hashigo is next on my list. Yup. I always get the non-spicy version, or as all of these restaurants call it, "white". But the dish doesn't have to have any seafood in it. I believe you got some clams because someone in the kitchen really liked you! Usually, it's just the meat that is advertised, or no meat at all if you like it that way. Guilty as charged. :-( I always order it "white", because my body is notoriously intolerant of spicy soups. For some reason, the one-two punch of hot broth and hot spice always engenders a sweat waterfall to cascade non-stop from my brow. So to save my dining companions and I from undue embarrasment, I save the spicy soup consumption for when I'm at home, with a towel at my side! BTW, PE, I've been trying to comment on your blog for the past four days. But something about Blogger Beta is not allowing me to (even as an Anonymous poster)...I can't post on any Blogger Beta blogs though, not just yours! Frustrating! Because I had a lot to say too! I still haven't tried Kaju to this day. Have to. Must! BTW, as I said to PE above. I've been trying to comment on your posts for days, but cannot. Blogger Beta is the issue, and it's irking me that I can't do so. I dunno! Your guess is as good as mine. I bet the previous owners just got tired of the daily grind and saw the opening to sell and did. Oh well, restaurants come and go. 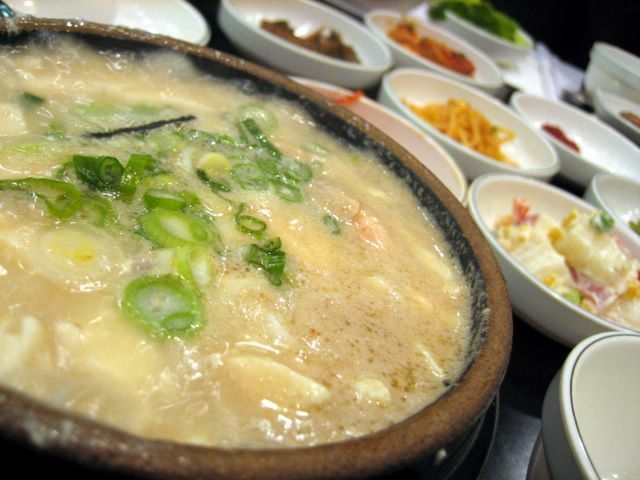 But sundubu looks like it'll stay in Irvine, so long as people like us enjoy them. I really enjoy your blog. Although I refuse to eat at any Korean restaurants in Irvine/Tustin, your description made it sound so yummy. (I won't eat Korean food unless it's (1) homemade; (2) LA's K-town; or (3) Garden Grove.) You've actually ALMOST convinced me to eat at this Irvine joint - which is weird since I hate soondubu jjigae (amazing considering I'm Korean). Keep up the great work! awesome blog. I was doing a search for TK burger and your site showed up. I have to say that I really enjoyed your reviews on the vietnamese foods. keep up the good work. I'll be adding you to my links if thats okay. cheers! Do you log into your account first and then comment? I had problems with Beta but it seems that as long as log in first so my ID is saved, I can then comment on others' blogs. You just convinced me to get out and try Korean places in Garden Grove! Thanks for visiting. I'm glad you like my site and what I've written about Vietnamese food. I still have a lot to learn about it. Yeah, like Tom Yum "Goong"! I thought that too. But apparently, Goong has something to do with Korean Royalty, per the nonsensical and grossly misspelled explanation they have on the menu. Whatever the problem was, it went away yesterday. I was able to post on any blog I wanted to. But this lesson has taught me not to use anything Blogger labels as Beta. I think I do need a Corona! Now I want to try kimchi jjigae! watch out for Hashigo. I went yesterday and found it extremely disappointing. We tried the bulgogi and bibimbap. The rice for the bulgogi had too much water and there weren't many toppings. Anjin, the restaurant next door, has better bimbimbap. Worst of all, they don't provide the usual banchan--we ordered the kimchi combo ($4 for 3 small plates of different kimchi) separately. The prices don't strike me as particularly cheap either. For the South Coast Plaza area, it's not bad... but it's not worth driving out to Costa Mesa. There are better restaurants in Garden Grove. Thanks for the warning. I'll keep my expectations in check then. Perhaps I'll try Anjin instead. New Korean restaurant in Costa Mesa called HASHIGO TOFU. Check it out - the best tofu stews,kal bi, appetizers, duk bok gi...3033 Bristol St. (Bristol & Paularino) i Costa Mesa. Ive been to Hashigo and this is the best place for good Korean food, service and drinks. They have a grand opening special going on right now 50% off on all beer and soju!!! Three plasma TVs. Check it out. The frequency of your comments (three within the span of 10 minutes) and the wording leads me to think you are somehow affliated with Hashigo. If you are, you are more than welcome to reveal your true identity here or talk to me personally at elmomonster at yahoo dot com. No need to shill here. Tried out Kaya today based on your posting. The tofu soup tasted the same as everywhere else. The service was particularly good... or maybe the place was just empty. 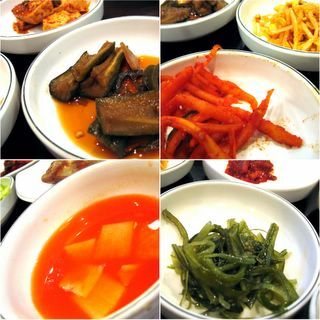 And yeah, the banchan selection is good there. surprised to hear someone comment that Hashigo Tofu wasn't good. Because three of my friends and I went there on a Wednesday night and everything was so awesome. Yeah they didn't give out the variety banchans but that' why they are so cheap. And I don't think they are your typical traditional Korean restaurant..It's a much more trendy place ith modern style, which I liked. Their BBQs are realllly good! And their tofu stews - excellent. We are planning to go back this coming week for sre. I guess it wasn't bad. Hashigo is just inferior to other restaurants in Garden Grove or Irvine. 1. A kim chee platter for $4 is not cheap. The BBQ tasted about the same as several restaurants in the Garden Grove area--but those places included banchan for about the same price. 2. Not many dishes to select from. 3. And the ambience was OK--but you can find the "modern" themed restaurants elsewhere as well. I rather focus on the food. 4. The bibimbap still annoys me. I got only 3 octopus tentacle pieces on mine. There weren't many vegetable toppings, mostly generic vegetables (wtf no fern!?!). And they stuck way too much oil on the bottom of the bowl. Honestly, I have no clue why Hashigo gets so much hype when it is no better or particularly cheaper than the restaurants in Garden Grove. There's hype for Hashigo? Well two of the posts made by Anonymous above, like Elmo said, are probably shillers from the restaurant. Hashigo was mentioned in the comments section of another one of elmomonster's posts, on chowhound, and on ocweekley as well. tried kaya in irvine and it wasn't bad. i also tried hashigo in costa mesa last night and it was pretty good. i thought the interior was nice. but no one can beat korean food like the ones in l.a.
My friends and I have been going to Hashigo since they opened and we love their food. And their price is cheap compared to other Korean restarants, especially the BBQ's. Come on dude..Kalbi hot platter for 10 bucks?! Most places charge over 14 bucks or more. I'd rather go to Hashigo than to any others in O.C. for sure. I will try their bibimbab next time and see for myself and will advise. But you gotta love their stews man...tasty for sure. Are there any korean restaurants in South County? I love Hashigo!!! Their crispy chicken is awesome. I crave it everyday, really. I have to admit. Hashigo Korean restaurant in Costa Mesa knows how to treat customers. I am hooked on Hashigo salad and mama cho chicken wings..that was absolutely delicious. Servers are very friendly and goes the extra step. Cheers! Warning to those looking to try Hashigo. The above comments are most likely posted by shillers from the restaurant itself. Hashigo Korean Kitchen needs to lower their prices and offer complementary kimchi; it's standard in every Korean restaurant to offer complementary kimchi!